And then I realized…It’s Sunday. I didn’t know whether to cry for my work-addled and sleep-deprived brain or laugh for the realization that I actually had one more day of weekend to enjoy. I decided to take the high road. And after one day filled with eggs Benedict, French toast, steak, time with family, a hilarious video of a post-university Europe trip, true laughter with old friends, a gift of two artisanal jams, and two potential cabinet makers to make my cabinet dreams come true, I am so glad I did. But just in case we need still need comfort, here is some soup. It’s got bacon. – Place the squash, the bacon slab (left whole or halved to make it fit your pot), onion, garlic, dried herbs, and black pepper in a pot. Cover with water. The water should reach about 1/2 inch above the ingredients. – Bring the pot to a boil and then lower to a simmer. Simmer until the squash and bacon are tender. – Remove the bacon from the pot and set the pot aside to cool slightly. Meanwhile, chop the bacon into small chunks. – When the pot’s contents have cooled, add half the chopped bacon back to the pot and process everything with an immersion blender. Alternately, you can process this in a blender but you may have to do it in batches. Either way, process until smooth. – Put the pot back on the heat. Add the rest of the chopped bacon slab, the cream, and the nutmeg, and stir to combine. Heat through, stirring, but do not let it boil. Taste and add salt if needed (your bacon may be salty enough). Butternut squash is not something we have always had in our markets or grocery shelves. It is appearing more and more though, much to my delight. 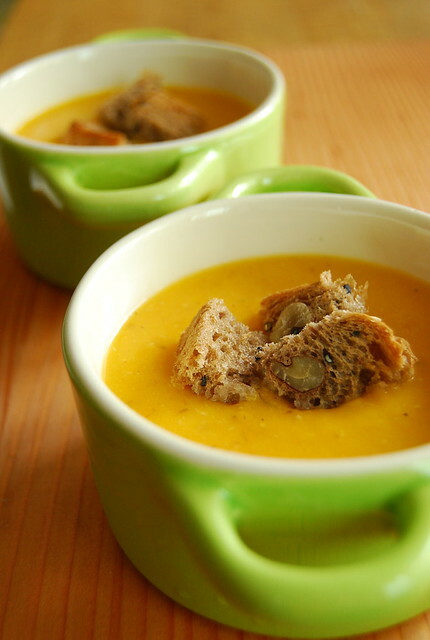 I love squash soup but I especially love butternut squash soup. And, of course, you can also make such heavenly creations such as this. My favorite squash soup comes form a restaurant over here called Cibo, and it has little bits of pancetta in it. I have never been able to successfully recreate it at home, and this one is not quite the same. It does, however, capture that delicious blend of squash and smoky bacon flavor that I love. So this is definitely going into serious rotation. Especially since we are approaching more soup serving weather. You can use fresh herbs if you like…I didn’t have any so I used dried. I love this with the retro bordering on campy addition of croutons. Just brush some day old bread with olive oil and toast…or get fancy and sprinkle some herbed sea salt on while you’re at it. I also like it with a dollop of yogurt on top. Or some drops of truffle oil – I know, more camp, but I eat what I want and to hell with the naysayers. So here I sit, happy with my “bonus” day and ready to face the work-week ahead. Hope you all had equally pleasant “surprises” this weekend! where can you get butternut squash in the philippines? I cant eat Butternut Squash by itself so maybe i could try this way. I need to add a few more vegetables to my diet. This might be the perfect way. Thanks for sharing! Hi Leslie! I love it by itself too…just roasted 🙂 But this is also a wonderful way to have it! Oh, yum! This is just the thing for a stormy evening! Oh, goodness! This looks like the perfect thing to sip on a cold night – or maybe dip slices of buttered bread into! I want to eat this for my breakfast. It looks delicious.